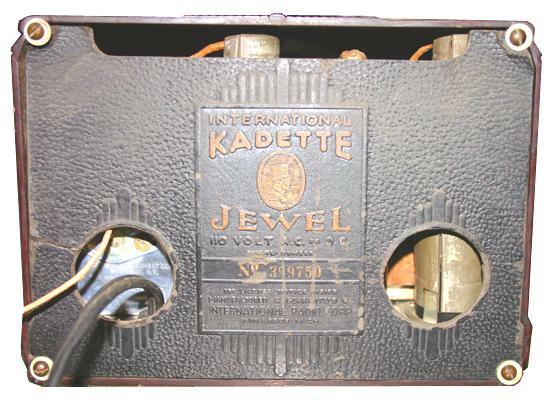 This remarkable Kadette "Jewel" was purchased from ebay in good shape. 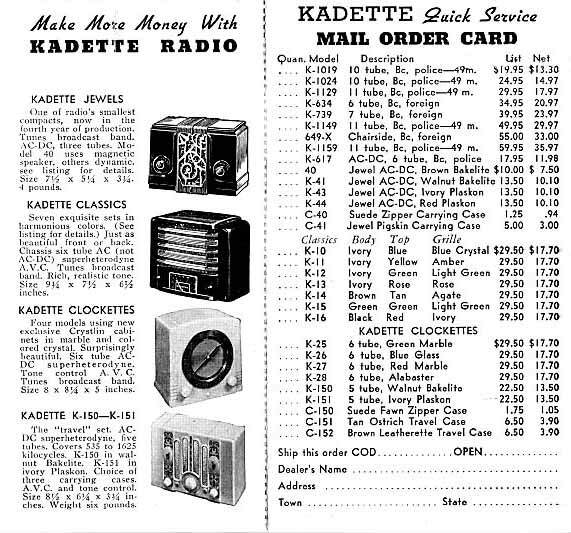 At first I had the impression these Kadettes were about the size of a small lunchbox, but I was astonished to see the actual size when the radio came in the mail. The cabinet is just about the height of a coke can, and a 6C6 tube from the socket to grid cap just barely fit in the cabinet! Kadette sure was not kidding when they called this radio a Jewel! 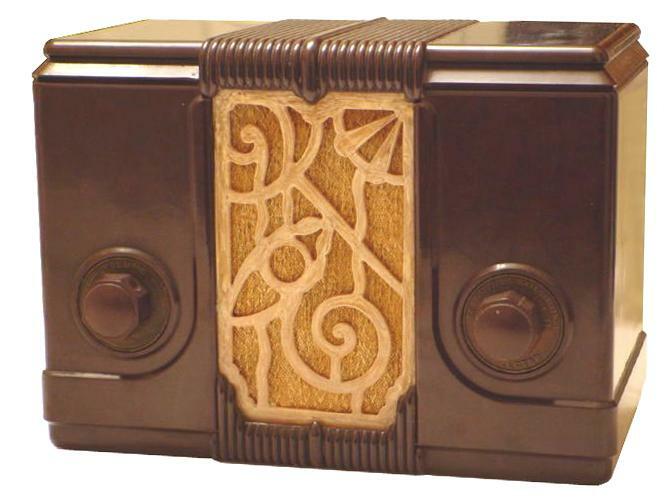 This radio still has the original tenite grille and the back cover. 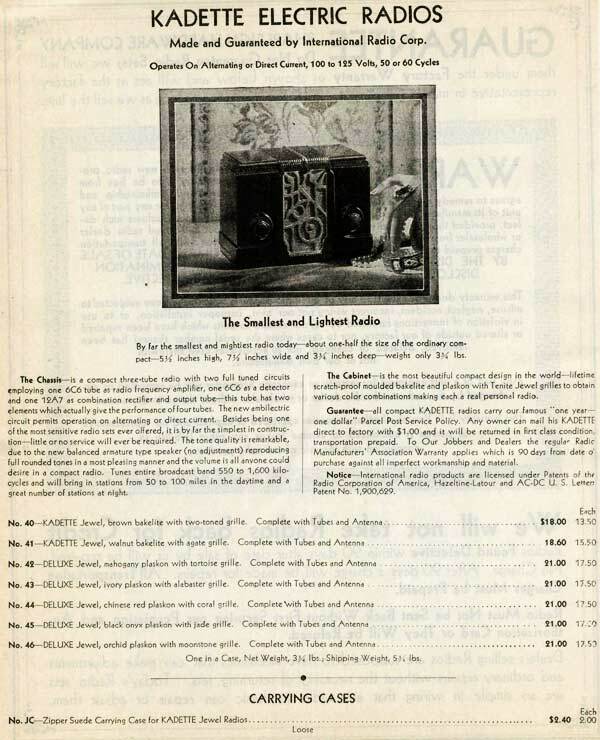 While the brown bakelite cabinet is the most common, International Radio Corp sold the Jewel in different models for alternative cabinet colors including the 40 (Brown bakelite with tone-tone grille), 41 (Walnut bakelite with agate grille), 42 (Mahogany plaskon with tortoise grille), 43 (Ivory plaskon with alabaster grille), 44 (Chinese red plaskon with coral grille), 45 (Black onyx plaskon with jade grille), and the 46 (Orchid plaskon with moonstone grille) as shown in the ad below. The original price of the model 40 was $13.50 in 1935 and was later reduced to $7.50 in 1938 as shown in the dealer brochure snippet below.